Besides the usual carbohydrate staple items of potatoes, rice, dried pasta, noodles and couscous in your store cupboard, you might like to try some of these other ingredients that can be used for enriching and making food more interesting for the dysphagic patient. Quinoa (The Mother Grain of the Incas). Unlike wheat or rice, quinoa is a complete protein, containing all the essential amino acids. It is packed with dietary fibre, manganese, phosphorus, magnesium and iron. It is also gluten-free and easy to digest. Some say it is as close to a perfect ingredient as you can get. It can be an alternative to rice, but I also used to put in a handful into soups and stews to enrich Alex's food. Beans and lentils. My store cupboard is full of assorted beans and other pulses (red, green, and yellow lentils, black-eyed peas and beans, split peas, butter beans, chickpeas and many others) as they are rich in protein, fibre, complex carbohydrates, iron, magnesium, potassium and zinc. They add wonderful flavour to soups and stews and add viscosity, especially red lentils as they disintegrate on cooking. Do read packet instructions carefully though as most pulses need soaking before use. Kidney beans need particular care as they contain a toxin which is only destroyed by proper cooking. If you are wary of using dried pulses, then use ready cooked, tinned varieties although these are, obviously, more expensive. If tins are large, any surplus pulses can be frozen. Baked beans. The humble baked bean is packed with protein, fibre, iron and calcium. It contains low GI carbohydrates. The tomato sauce covering baked beans lends itself to easy puréeing if needed. Pearl barley is similar to wheat in its nutritional value and high in fibre. It is another useful ingredient for adding texture to soups and stews, especially when made in a slow cooker. You could not make Scotch broth without it! Ground almonds are often one of the best ways to get our essential fatty acids, minerals and amino acids in a form that is super easy to digest. They are rich in fibre, vitamins, manganese and potassium. I used to add a teaspoonful to Alex's breakfast cereals. Desiccated coconut contains no cholesterol and is a good source of manganese. However, it does contain quite a lot of saturated fat (the bad sort of fat), but, used sparingly, is wonderful in Thai curries or breakfast cereals. Breakfast cereals such as Ready Brek and Weetabix are good for the dysphagic patient as the viscosity is right and the texture smooth. To give flavour and additional nutrients, I would add powdered milk, honey (not sugar – see Honey section below) and ground almonds. As it was such an easy food for Alex to eat, he did not limit it to just breakfast time – very often it was the only thing that would go down safely at any time of day. You can also add mashed banana, strawberries etc if suitable. They are quick and easy to use and do not alter the taste of food. I discovered them when I had to prepare a meal for a coeliac (the granules are gluten free although the packaging states they may contain wheat) and they have been an essential in my store cupboard ever since. If you need to thicken tea, coffee, fruit juice or cold liquids, then use Thixo-D or Thick and Easy which are usually available via your GP. Dried milk can be used in almost anything that contains a liquid. Although milk is one of our most complete foods and so good for enriching meals, dry powdered milk is a very quick, easy way of enriching a food which already contains sufficient liquid. Adding just fresh milk for enrichment often makes a food too runny. I used to add it to anything that already contained some fresh whole milk. Complan is a useful standby product. I used to keep sweet and savoury versions for those "emergency" situations. Baby food jars (savoury ones) were sometimes useful when Alex could not swallow a meal I had prepared and I had to then provide something quick and nutritious. I found that seasoning had to be adjusted though due to the necessary low salt content for babies. Milton's Multigrain Crackers or rice crackers were very useful when Alex had difficulty swallowing bread. He reckoned that, with a moist topping, the Milton's crackers in particular would melt in the mouth with chewing and so he was able to swallow them. Honey. Whenever I needed to use a sweetener in food e.g. a cereal or particular recipe, I used honey instead of sugar as it is easier to absorb, you tend to use less of it as it is sweeter and it still contains minerals and vitamins which are destroyed when sugar is processed. Peanut butter is a good source of protein, potassium, fibre and healthy fats which Alex used to enjoy on wraps or crackers for a change. Semolina is ground durum wheat often used in making pasta. Some of you will remember semolina pudding that was served in schools years ago - it was an acquired taste! However, do not dismiss it for the dysphagic patient. It can be made more interesting by adding an egg, vanilla, cinnamon, mixed spice, ground almonds, orange zest, nutmeg or honey or (if suitable for your patient) pomegranate seeds, cranberries or raisins. Try combinations of these ingredients and make the pudding in your tiny Pyrex casserole dish. Alternatively, semolina can be toasted for a few moments in a frying pan and then used as a change to couscous. Canned fish (especially sardines which are very high in good Omega 3 fatty acids) are good sources of calcium and Vitamin D. I tended to buy ones in a tomato sauce as opposed to oil for added flavour and ease of blending. Alternatively, I would add mayonnaise to mashed tinned salmon or tuna. Eggs, especially fried or soft boiled ones, proved very difficult for Alex to swallow. Therefore, I tended to incorporate them occasionally into his diet by mixing a raw egg into mashed potato or baked beans – this may sound unpleasant, but the heat of the mash or hot beans quickly cooked the dispersed egg which was actually not visible. If you do not like the thought that the egg might not be fully cooked, just re-heat the mash or beans. Despite fairly high levels of cholesterol, eggs are a superb source of protein and provide good levels of iron, vitamins and selenium. Olive oil is used in most of the recipes I make. Although nothing beats the taste of butter in my opinion, olive oil is far healthier, especially the extra virgin variety. It is a great source of good fatty acids and vitamin E.
Spices can make such a difference to making dysphagic food tasty. Stock as many as you can and experiment with flavours and combinations. 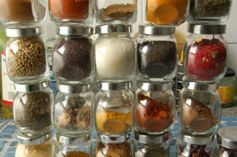 In my experience, refrigerating or freezing food often reduced the intensity of flavour of the spices and lowered the hotness of chilli, so you may need to check seasoning again before serving. Fats in soups are great because they add calories, creaminess and we are less likely to over-eat them in this form. Often half of an avocado can make all the difference to whether a soup tastes amazing or tastes terrible. Other kinds of fats, like nuts, peanut butter, coconut, olives and even olive oil will often work too. The rind of parmesan or stilton cheese adds calories and a fabulous taste, especially to broccoli soup. You can always remove it before blending if you wish. It all depends on the type of soup you are trying to make. So experiment and not just with soups. Now the less healthy store cupboard foods! Chocolate bars. Although not very healthy or nutritious, Alex found that the snack size ones of soft variants like Maltesers, Milky Way, Mars etc were quite easy to swallow following chewing. Also, being bite size, he did not have to concentrate for long to eat one and the calories in them were better than no calories at all. Cereal bars and granola bars can also provide a snack that many dysphagic patients can cope with if they chew them well. Walkers Quavers (a potato-based snack which dissolves in the mouth) were much safer to swallow than crisps and other snacks which required better chewing. Lemonade. If a dysphagic patient has to have a stent fitted to aid swallowing, it is not self-cleaning like the oesophagus and so the patient will probably be advised of a cleaning routine for the stent using lemonade.